Manuel Attard has been writing professionally since 2009 and has written nutrition articles for the Malta Exercise, Health and Fitness Association. He is a Registered Nutritionist (U.K.) and a CYQ qualified fitness instructor. Attard has an honors Bachelor of Science in biology and chemistry from the University of Malta and a Master of Science in human nutrition from the University of Glasgow. Sardines are a type of small oily fish. They are often sold canned and are rich sources of omega-3 fatty acids, vitamin D, calcium and protein. Canned sardines have their heads removed and are cooked by steaming or deep-frying. They are then dried and packed in vegetable oil, brine or sauce. A typical water-packed can of sardines contains around 140 calories, 20 grams of protein and 7 grams of fat. 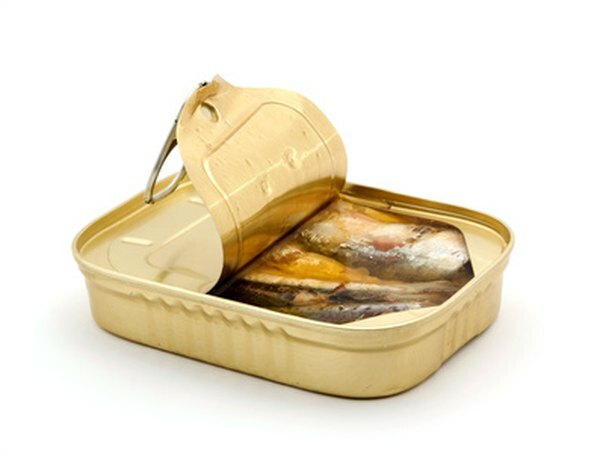 Sardines packed in oil contain more fat and calories. Sardines are oily fish and rich in the polyunsaturated omega-3 fatty acids eicosapentaenoic acid, or EPA, and docosahexaenoic acid, or DHA. EPA and DHA are only found in seafood and seaweed and have been linked with a number of health benefits. A trial published in the March 2007 issue of “Atherosclerosis” notes that consumption of 1.8 grams of EPA daily for two years was found to reduce the thickness of arteries, hence improving blood flow. Omega 3-fatty acids are also important components of the brain and retina, and, as indicated by a trial published in the August 2010 issue of “The Proceedings of the Nutrition Society,” also have anti-inflammatory properties. Canned sardines, when eaten with the bones, are a concentrated source of calcium. Calcium is essential for healthy bones and an inadequate intake causes rickets in children and osteoporosis and osteomalacia in adults. Canned sardines are also a good source of selenium, a trace element, which is part of an antioxidant enzyme. Antioxidant enzymes help prevent oxidative damage caused by free radicals. Selenium deficiency will exacerbate iodine deficiency and may cause infertility in males. Few foods provide vitamin D, and canned sardines are one of them. This vitamin is synthesized in the skin during exposure to sunlight; however, people living in areas away from the equator or who do not expose themselves frequently to the sun, may become deficient in this vitamin. Vitamin D is essential for healthy bones and for proper immune function. A drop in vitamin D levels may also be the cause of seasonal affective disorder. Sardines are also an important source of niacin and B-12. Niacin helps the body convert food to energy, while B-12 is essential for red blood cell production, proper nerve function and in the metabolism of homocysteine. Sardines contain much lower levels of pollutants than large fish such as marlin and swordfish. However, they contain considerable amounts of sodium, and, thus, should be limited as overconsumption can lead to high blood pressure.